Ever wonder what the world's first helicopter gunship was? Was it the AH-1 Cobra? Nope, because that was designed to supplement the UH-1 gunships. Those UH-1 gunships also weren't the first, either. They were just the first in combat. So maybe that means the OH-23 Ravens of the Korean War? No, since they weren't armed, even if they were flying over front lines. The answer actually came about within a few short years of the korean War, when aircraft armament restrictions against the US Army eased and in 1955 they issued their first contract for an armed helicopter. That helicopter was the YH-32A Sally Rand. 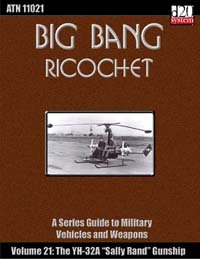 The helicopter itself was left over from a prior failed aircraft experiment (the helicopter worked, just wasn't suitable for military use in any way), stripped down to the airframe and used as a test bed for various weapons, including unguided rockets, machine guns, recoilless rifles, and the first anti-tank guided missile to be fielded by the United States, the French-made SS.10. While it was never meant to fly into combat, the YH-32A served a pivotal role in the development of military rotorcraft by proving that helicopters could be stable and effective weapons platforms. On a side note, unlike other Army helicopters that were named after birds or Native American tribes, the YH-32A was named after a famous burlesque performer who wowed audiences at the 1933 Words Fair in Chicago.